Pollsters say PM Modi and the BJP's re-election bid got a boost from a wave of patriotism after the suicide bomb attack and the Indian government's fast response. 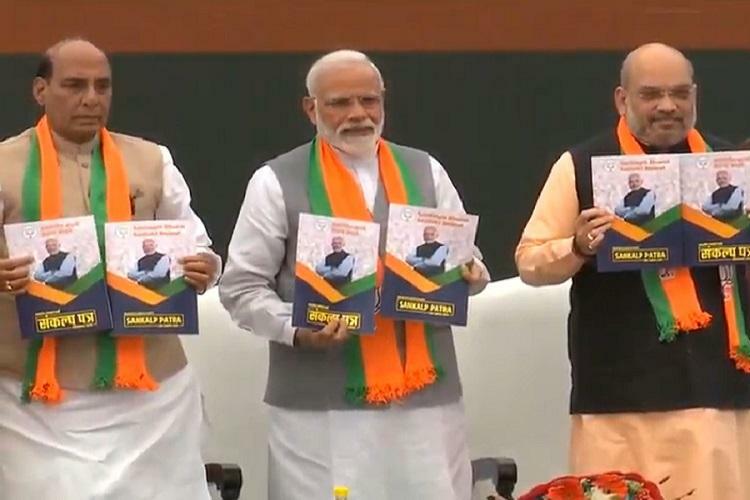 "Nationalism is our inspiration", Prime Minister Narendra Modi said at the release of the BJP's election manifesto at the party headquarters in New Delhi. The Prime Minister said Congress is a party that wants to give open licence to anti-nationals because the party and their friends think alike. "Had Congress leaders acted wisely during the pre-independence era, this Pakistan would not have born", Modi stated. "Let them do it and it will pave the way for our azadi", Farooq Abdullah, president of Kashmir's National Conference party, told an election rally, referring to freedom for the region. The prime minister reiterated his allegation that the opposition parties that they were questioning the valour of the security forces post last month's Pulwama terror attack. PM Modi, while speaking at the Latur rally said, "I have come to know that you are sitting here since 9.30 AM". The result is not due until May 23. In Maharashtra, Mr. Modi asked for votes in the name of the soldiers who fell in a terrorist attack in Jammu and Kashmir in February.